January 1979: (Ref 06621 in English, 06623 in German) The original 110 system manual had the white ASAHI 110 picture on the front with 33 pages. The range of accessories was limited to the 18mm, 24mm and 50mm lenses with filters and hoods, the AF130P flash and the Winder. February 1981: (Ref 06621 in English). Now 37 pages long the front cover has the “auto 110 system” words with an orange background. This manual is a complete re-write and includes a mention of the 70mm telephoto, 20-40mm zoom and the 18mm PF lens. The AF100P is also given a mention for the first time. The manual gives some user warnings for the first time - probably from user feedback - on care needed when changing lenses, removing the batteries if not in use, and the battery life is reduced from 10,000 images or 1 year to “several months”. A revision was made in May 1981, July 1981 and another revision was made in August 1981 to include the warning about the correct method of removing the lenses. The same manual also appears with the revision date of September 1981. December 1982: (Ref 06651 in English, 06653 in German). The auto 110 super manual in 41 pages. The number of Pentax distributors had increased to include France, Switzerland, Sweden, and Holland. The “AP” logo on the back page is now replaced with the more modern PENTAX style. A revised manual was released in June 1983 with some text in blank instead of pink but the main change was a bolder copyright notice on the back page for PENTAX and a modified address for the German outlet. A further revision came out in November 1984.
circ 1979: (Ref 06631 in English). This manual came with a black Phillips 110 set yet the cover shows a white ASAHI. The images and text are exactly the same as the 1979 110 manual. A revision dated April 1980 is exactly the same but the white ASAHI is now black. AF100P - May 1981: (ref 06056 in English). 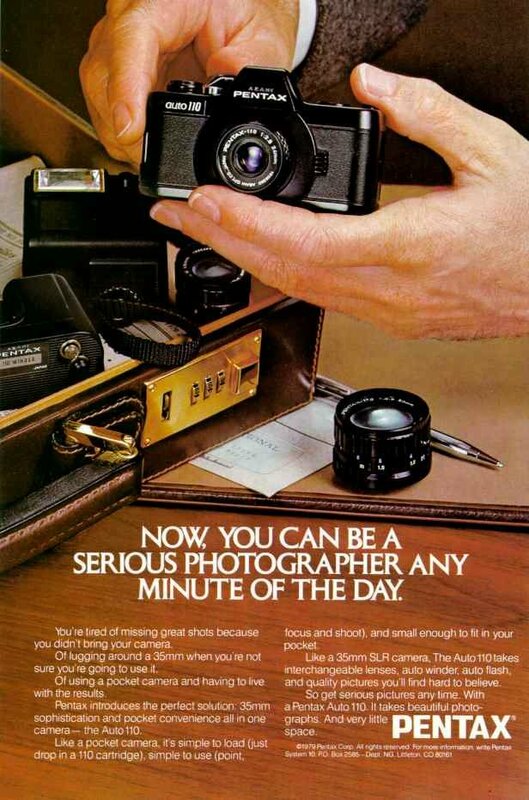 15 pages long and a black ASAHI camera on the cover..
May 1981: (ref 6636 in English). 21 pages of quite detailed information on the final range of 110 lenses and filters. A revision to the manual came out in July 1981 and August 1981 to include the warning on Page 19 about the correct method of lens removal. Another revision came out in April 1982 with France on the list of Pentax distributors. In July 1983 the wording remains the same only the front cover title has a red instead of an orange background and the rear cover lists the additional Pentax companies in France, Switzerland, Sweden, and Holland. One of the very last manuals dated September 1985.
circ 1979: (Ref 06626 in English). Shown mounted to a white ASAHI 110 but in a boxed winder that was not ribbed makes dating this manual difficult. Images and text are from the January 1979 110 manual. II - June 1982: (ref 6626 in English). Interesting aspect of this manual is that it is shown mounted on a 110, not a 110 Super. This means that the Winder II was not released with the 110 Super as often suggested. Still no warnings about breaking off the battery clips! From http://www.pentax110.co.uk/html/manuals.html an unofficial site, based on web research and a growing collection and has no connections with with the Asahi Optical Company or Pentax. steve@pentax110.co.uk.